Hurrah! Spring is here! And with spring comes all the petals and colors and inspiration of spring. 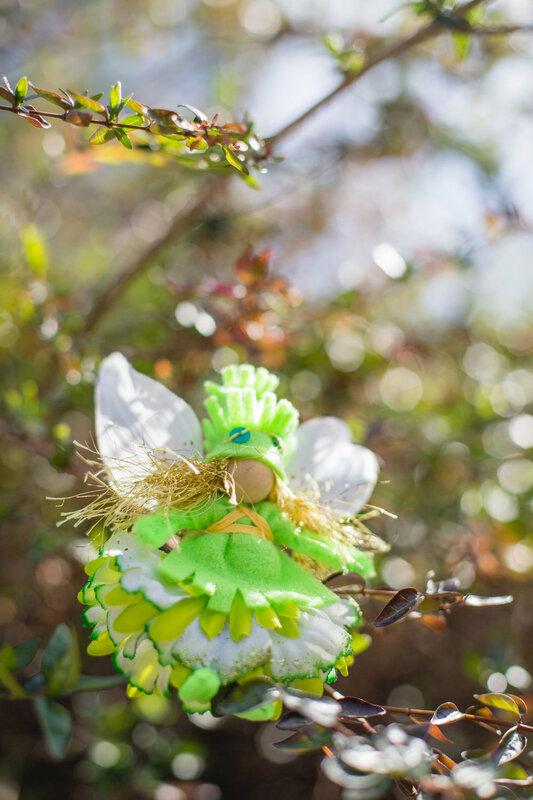 Now is the perfect time to make little fairies for Easter Baskets. 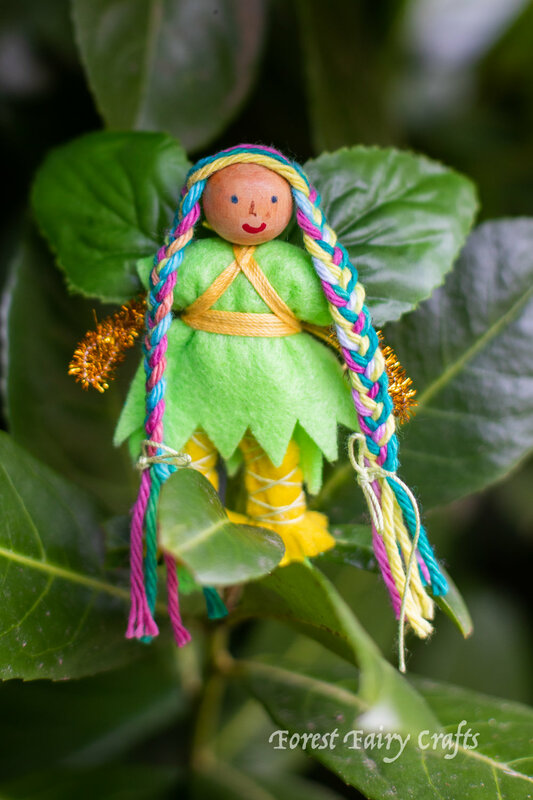 Or gift the book Magical Forest Fairy Crafts through the Seasons for delightful crafting with little people in your life. Celebrate the many ways we grow together! We’re excited to bring out all the colors of spring. Happy changing of the seasons! And to our friends on the opposite hemisphere, happy Autumn! This post does contain affiliate links. Should you choose to purchase a copy of our book, your price remains the same while we receive a small compensation for referring you. Thank you for supporting the forest! The Leprechauns wish you a delightful Saint Patrick’s Day! The leprechauns found gold! Here’s to all the little folk surprising little people with magical antics today! The leprechaun gold is actually pebbles painted with gold paint (not for little people that taste their toys). The past few years have seen Leprechauns learning new skills. And a very secret type of Leprechaun is the Leprechaun Ninja. What, what? Think about who protects the gold, who can change rainbows, and who is willing to put everything on the line for adventure? Especially with the rise of Leprechaun Traps in the world, these ninjas enjoy going on quests to help their communities. We had a great time making her one rainy afternoon. My daughter thought of the idea for rainbow braids, because Leprechauns are fond of rainbows (another meaning to gold at the end of the rainbow being a golden personality :)). That led to a little challenge, which is usually solved by gluing the hat on the head. Adding the yarn for the hair leaves a little patch bare on the back of her head. I wanted the hat to be able to go on and off since her smile is cute. We solved this by painting the back of her head with a tiny bit of green paint, which looks like her hair color. The wings mostly cover the back of her head anyway. She is now a favorite new character in fairyland. We’ve been having fun mixing and matching different characters lately. 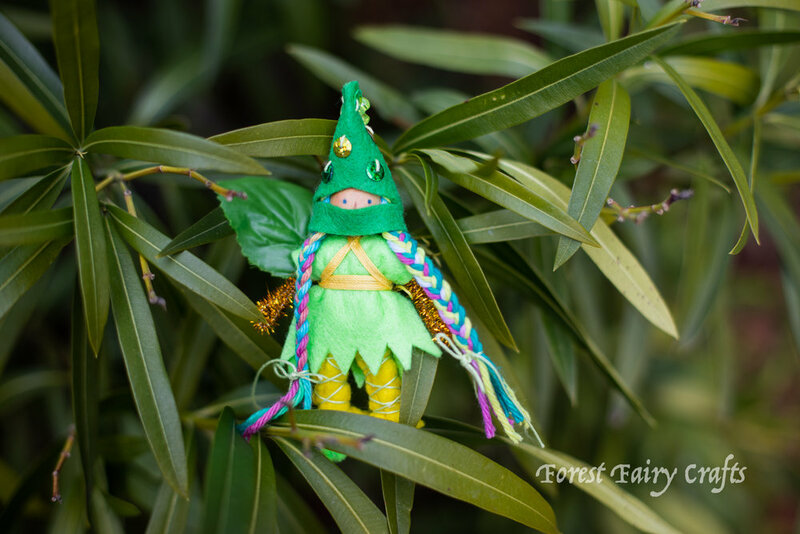 Directions for both the Ninja and the Leprechaun are in our first Forest Fairy Crafts book*. Now, for the best news of the day. She wants to explore. So we’re hosting a giveaway! Winner wins the leprechaun ninja made by Lenka sent anywhere in the United States (apologies to International friends). 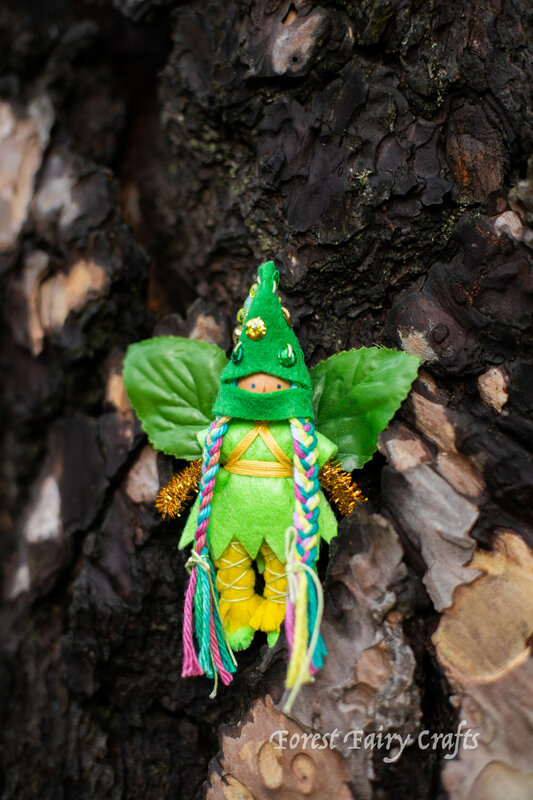 Forest Fairies are not appropriate for young children who enjoy tasting their toys (choking hazard). Hurrah for decorating! And hurrah for crafting homemade decorations that help a house feel like a cozy home. The personal touches that go into homemade decorations make for charming displays (and gifts). This year I made a Valentine Garland using our Magical Forest Fairy Crafts Through the Seasons book. And then we used the garland for a delightful Valentine themed campsite at Inn Town Campground. The garland can be made by anyone- children or adults. I find myself making decorations even when my children are older, because I love being able to share the spirit of homemade in every season. And it helps that winter is one of my favorite seasons for crafting. As the wind blusters and blows outside and rain (or snow) piles up everywhere, it’s lovely to sit with thread, sequins, and felt. For this garland, I followed the directions on page 108 for the leaf garland. The next page has ideas for making our own patterns and garlands. I used the heart as inspiration. Well, we give instructions and offer ideas for inventions and creative growth. After all, the world needs creative problem solvers and innovation. Why not encourage that with invitations to make craft projects unique? I sewed across the top third of my hearts, adding red sequins. I used large stitches. Between each heart, I strung a pom pom. If you don’t know how to sew, or if you’re making with children, our book has all of the steps for tying knots, adding sequins, and even cutting patterns. It’s an engaging, and rewarding, quick craft that can decorate anywhere from a mantle, windowsill, or campsite. This post does contain affiliate links. Should you choose to purchase, a small amount is given to the Forest for the referral while your pricing remains the same. Thank you! Welcome to a season of thankfulness (which really is every season, right? ;)). 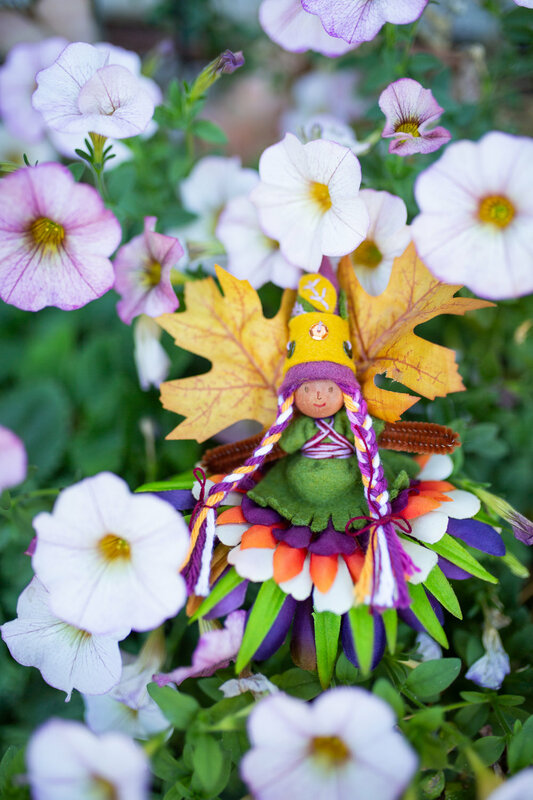 We adore creating this fairy for everything we are thankful for in our lives. We start thankful thoughts with a fairy that notices things to appreciate. From the very small little things like saying “please” and “thank you” to the very big things like air and mountains, the world is filled with amazing things to appreciate. 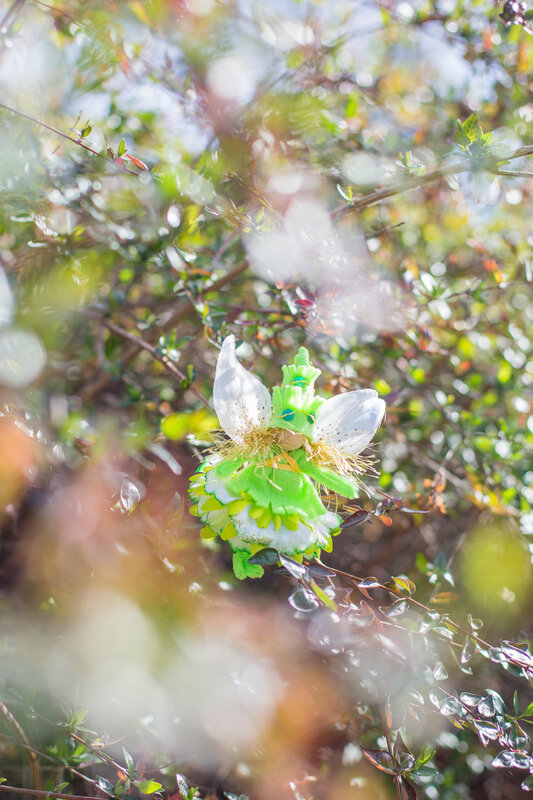 After making a fairy, we create a space for collecting gratitudes. Writing gratitudes is perfect for craft time at home, writing at school, or homeschool curriculums. Collections can be created many different ways. We’ve made a book by folding paper in half and threading it together along the spine. Click here for more ideas for sewing a book. Actually, as I reflected on how we made these books, I realized that we didn’t sew the Gratitudes together until the end, so busy beavers could have thirty pages while slow and steady learners could have seven pages and not feel intimidated by blank emptiness waiting to be filled. We’ve also written ideas on leaf-shaped papers to hang on branches for a Thankful Tree. And written on little slips of paper to collect in a box. The amazing thing about taking note of appreciation over time, is that kids notice more and more things that inspire their gratitude. We would start pages for a book, then, after collecting them for a week or two, we would bind them into a book. At first, children might struggle to notice a gratitude. Or they would go silly. I wouldn’t judge their choices. Everything is an important things to notice. And children move from idea to idea quickly. So the next day, perhaps they would settle into deeper connections. And, inevitably, they would have a collection of ideas that brought them pride, and maybe a few smiles too. Start with loose pages. That way they can collect without running out of room or getting overwhelmed by blank pages. For children who haven’t learned to write, an adult can write the sentences. Students enjoy reading their books no matter who writes the words. Younger learners, or learners who can use writing support, may benefit from an adult writing I am grateful for ….. on each page. Those learning to write can trace the letters I am grateful for … to practice. Or they can fill just the ends of sentences if tracing takes too much time. Add drawings. If you write, I am grateful for family at the top of the page, an illustration of family adds to the magic. Speaking of that, it’s fun and wonderful modeling to create a book with the children. The more gratitude, the merrier. 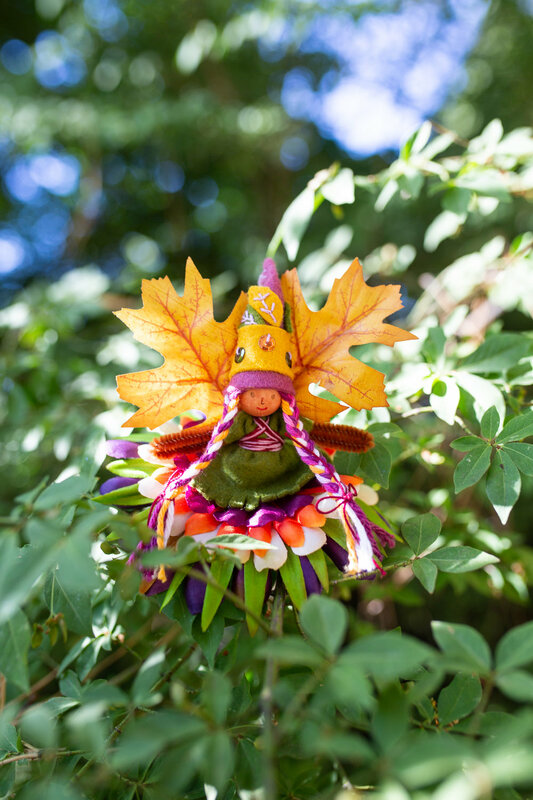 And directions to make the Autumn Fairy (perfect for gratitude) is in the Magical Forest Fairy Crafts through the Seasons* book. *affiliate link- should you choose to purchase, a small amount returns to the forest while your price remains the same. Looks like the season of the witch is here! We adore spooky witches and fun witches. This year, I decided to use different colors than the usual black or purple to make witches. This orange witch warms my heart. She’s so festive! And perfect for fall. Winner wins an orange fairy witch made by Lenka sent anywhere in the United States (apologies to International friends). Forest Fairies are no appropriate for young children who enjoy tasting their toys (choking hazard). 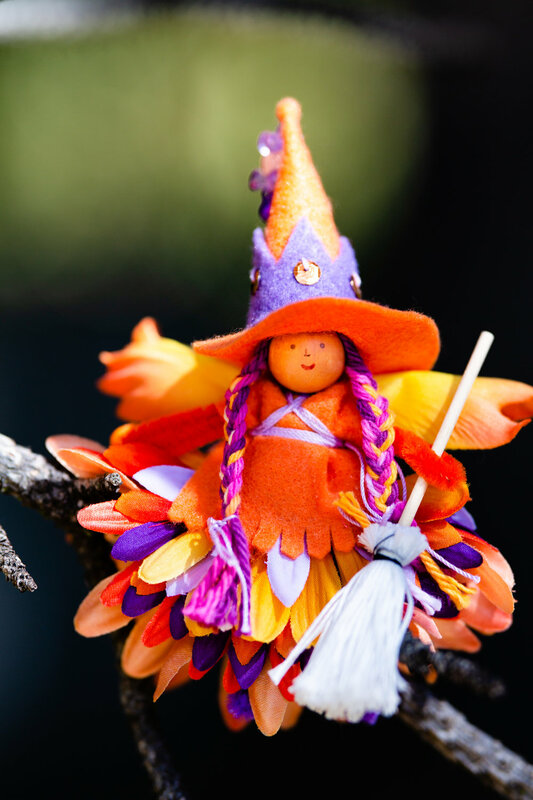 Of course, if you want to make your own witch (or a few witches), all the directions, with photos, are in our Forest Fairy Crafts* book. With zombies, warlocks, and wizards, too! 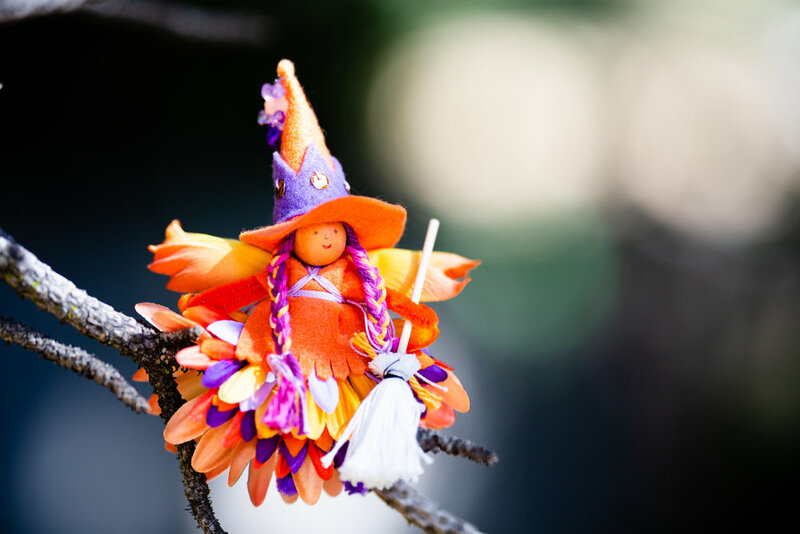 The fairy forest loves Halloween! *affiliate link- a small amount is given to the forest should you decide to purchase a copy. Your price remains the same. Thank you! An easy way to style fairy hair is pigtails. Her hair stays long and loose, yet looks a little bit fancy. We tie pigtails with double knots to stay put, but you could use single knots to style hair for different occasions like a trip to the park or a fairy ball. Have fun crafting fairies! Happy Friday! Even fairies love a county fair! Yay for discovering new fairies, gnomes, critters, and crafts. Yay for decorating homes with colorful, pretty garlands and ornaments. Yay for new ideas, new creativity, new celebrations. 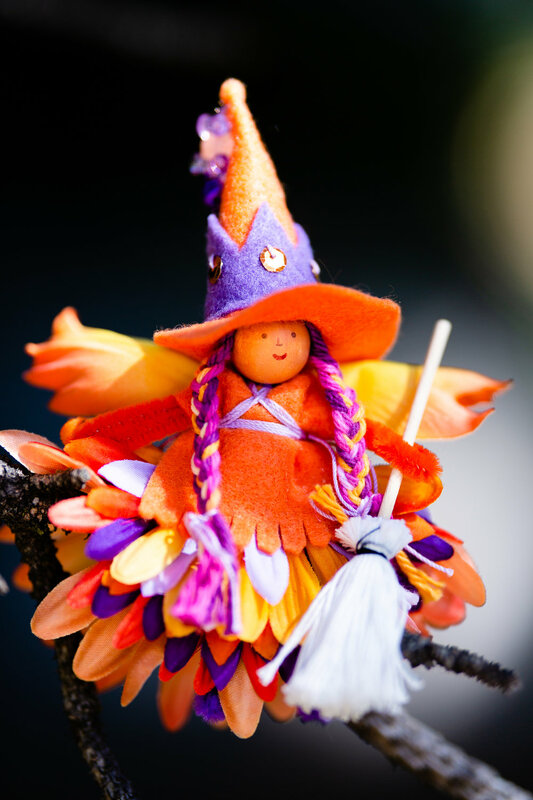 Yay for Magical Forest Fairy Crafts through the Seasons*! This book inspired us with new ideas and projects. We wanted to build on the foundation of the first book while giving new techniques and inspiration for our community. Here are five of our favorite things in the new book. We look forward to hearing your favorites! Crafting for Girls AND Boys- it was so important for us that everyone gets to craft. Every fairy has a version with a fairy wearing a dress and a fairy wearing shirt with pants. We notice that the crafter gets to choose what a fairy wears. Girls can wear pants and boys can choose skirts too, if they want. Fairies could wear kilts if they want! We often craft with boys who make fairies with dresses as gifts. We believe in including everyone. We also paid attention to colors throughout the book, from sample projects to design elements, to show lots of colors. We know that families craft together so it's important to include everyone in the creativity. Also, we see how boys love making toys and learning how to sew. Everyone gets to have fun together! Diversity in the Forest- we found a way to create many different skin tones on fairies and gnomes. By painting the wood with watercolors, we were able to showcase all skin tones. Having representation is so important to us. We teach painting. We also model many different skin types in the example photos. All children deserve to see themselves in the crafts they create. Even our kid models for this book show diverse ethnicities. Everyone gets to be included in the Forest. Empowering makers- making toys gives children tremendous creative expression. We teach the tools so that they can understand how to sew anything their imagination can design. We show one way, then invite other ways to make a project unique. This gives children an invitation to explore ideas and colors. We believe, strongly, that children are incredible makers. They love opportunities that empower the creative process. This book is a launchpad for creativity. Gnomes- In this book, we got to make more gnomes. We developed a new technique wrapping thread around their tummy to give gnomes more color and texture. And we realized that two capes are fancier than one. By making one smaller cape and one bigger cape, the gnome designs are cute and look fancy while being accessible for kids to make. 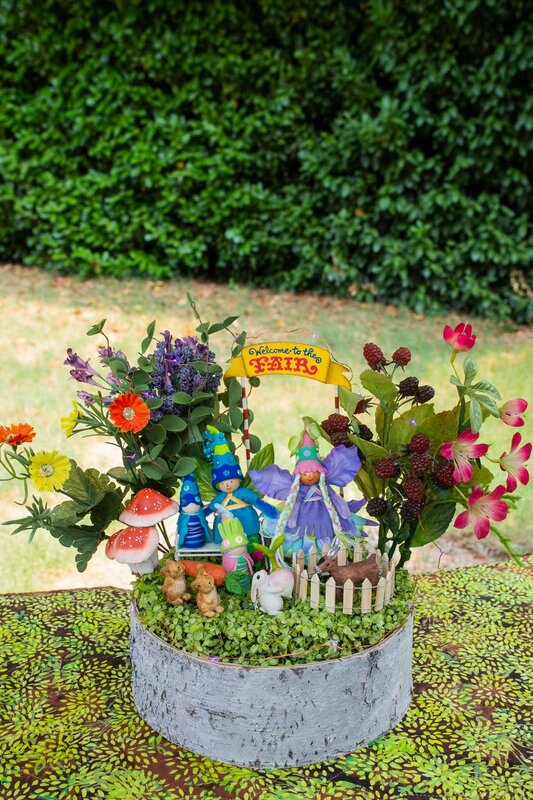 We include patterns and lots of photos for the gnomes. Garlands with hearts and blossoms. We cannot wait for every to get a copy of their own. Please, let us know what you think. What's your favorite project? Or your favorite idea in the book? You can order your copy on Amazon,* or visit your local bookseller. Let's return to the Forest! *affiliate link- a small amount is given to the forest by the seller while your price remains the same. Win-win :) and thank you! It's almost time! This is the month! 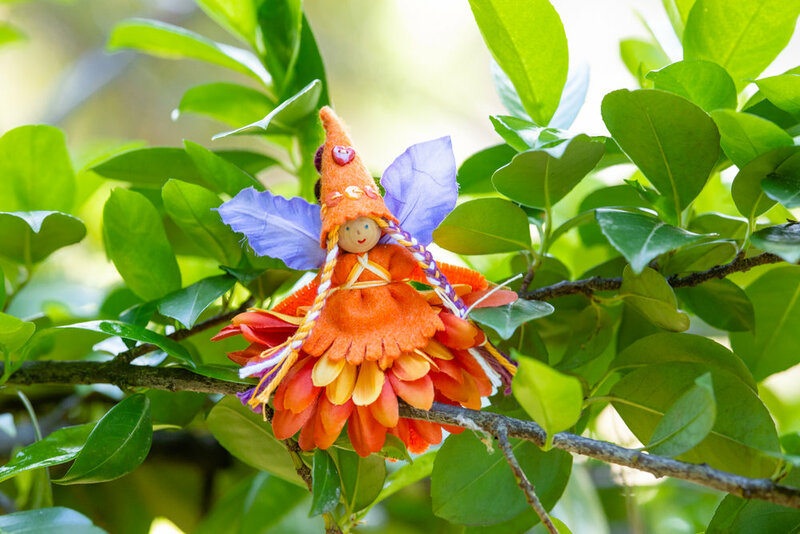 An entire new collection of fairies and crafts is arriving for children of all ages. The theme of this book is seasons. Each new season is a chance to celebrate and create. From the changing colors, to the scents of grass or cinnamon or snow, to the activities of collecting treasures or tossing beanbags, our book shares our favorite crafts. We keep adding to our summer shelf. There's still time for epic summer crafting. What are you making today? Thank you to all the people who have preordered the book and supported the forest through the years. We appreciate you so much! *affiliate link allows us to earn a small percentage from Amazon while your price remains the same. The world is not always easy. We want to protect children from the sadness of the world, especially the difficult moments or difficult ideas. However, part of our job, as adults, is to help them understand difficult ideas, from homelessness to grief to disasters. And, hopefully, we can empower children to make positive changes for the future. We can help children make sense of the world by showing them ways to express their support for helpers. Many groups and organizations showcase support with activities that may help children wrangle ideas into action. Every family, of course, needs to find their own way through a briar of life events that may or may not connect with a child's world. For example, I was a first grade teacher during 9/11. We planned to keep conversations at home, where, hopefully, children wouldn't see the worst of the news. Then a student learned that one of her relatives was in one of a buildings. That family couldn't possible keep distance between current events and their child. You may not get to choose when a child reckons with global or local events. What helped students throughout many years of teaching, and many scary events, was creating positive action. We made cards. We thanked first responders. We created thoughtful ways to express hope. I am dismayed, with heartache, every time I hear about guns in schools. I want to insulate my children, except they come home with stories of Quiet Drills, or stories about when they're supposed to run into the woods instead of hiding in a closet. These drills break our collective hearts. So my orange fairy shows support for Moms Demand and Everytown. I didn't want to put images of children online, but fairies are happy to be colorful supporting causes. Children may want to be involved with groups or ideals that resonate with them. They may want to help animal shelters or relief organizations. You may want to encourage social engagement. You may want to show support without posting images of children online. Enter the fairies. 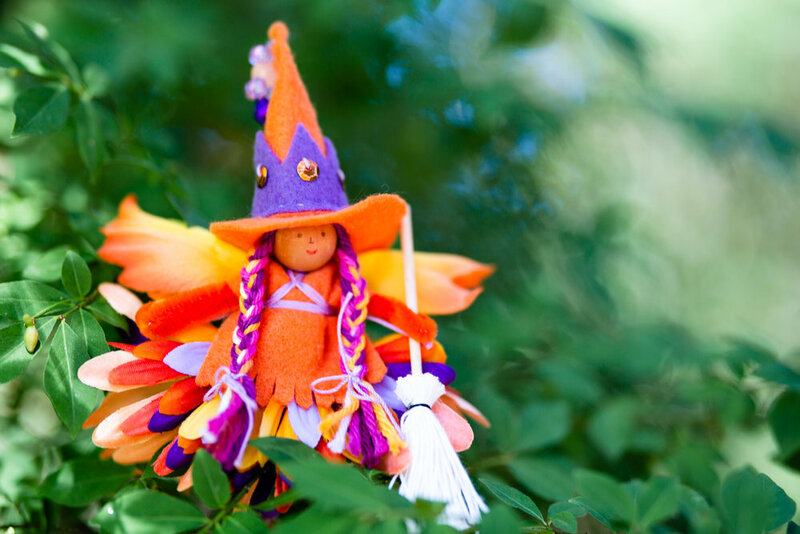 You can make fairies or crafts to support movements and empower children. Children can express themselves by sending crafts as gifts to first responders or people they admire. Or share photos of fairies online. Children, and fairies and crafts, can become the helpers. We know it's not easy. We know that we want to protect the children. We must treat their understanding of the world with compassion and care. Do your research before discussing any scary news events with children to learn what's appropriate for their age and understanding. If you do find yourself struggling with how to be a helper for children, perhaps crafts can help give intentional direction to the efforts. We all want a better world. We want children to believe the world is filled with good magic. Together, we can create more good magic in the world. I believe that with all my heart. Just as the fairies believe in us. I did try a new technique with the hat, using felt balls instead of beads on her hat, which turned out cute. I put a heart button on her hat to show that we can be guided with love. That love matters most. 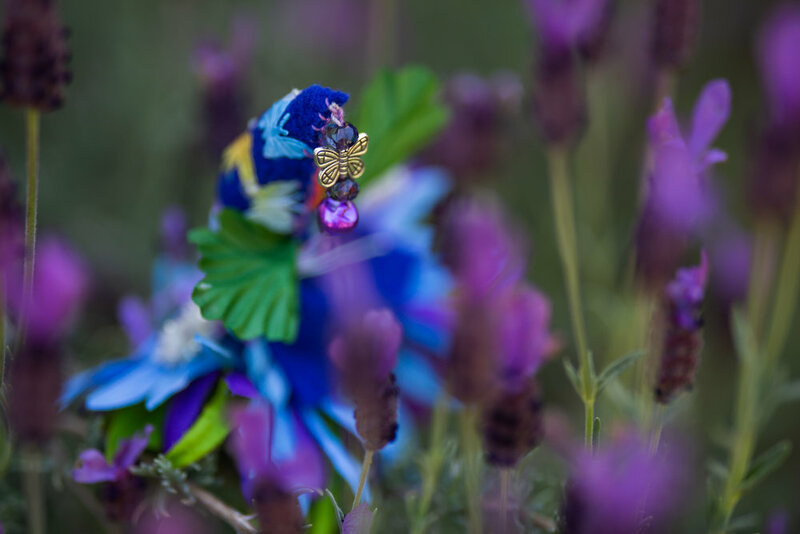 The Night Garden Fairy is inspired by evening in the garden, when light softens to dark blue and daytime critters settle down for a nap. Colors look different come evening, and for a few moments, during the Blue Hour before real dark settles over the forest, all the garden colors are especially lovely. This is her time. She visits all the butterflies to wish them good dreams as the moths wake up to play in moonlight. She started with dark blue felt. Then I found the bright butterfly ribbon and I knew I had to decorate a fairy with it. I puzzled, because each wing was thinly connected. And the butterflies were too small for sequins. So I used iridescent sequins and sewed one between each butterfly. It wasn't the most stable arrangement, so added a droplet of glue under one or two of the butterflies. I hope she inspires you too! It's the season of little people. They're in the leaves and under newly blooming flowers. They're finding beams of warming sunshine to warm their wings. Creating leprechauns is yearly magic. Of course, they may appear thanks to an adult inviting them into a home (making one to leave in a special place). Instead of building a "trap" which was popular for awhile, we build leprechaun homes, places where they want to stay and enjoy a cup of tea while they sort their gold trinkets. This year, I created a new leprechaun with sparkly gold hair and green felt. She wears skirts of green and white speckled with glitter (I was lucky enough to find the glitter-strewn carnations at a craft store). Along the way, leprechauns bring stories of magic and luck. Whatever your family story, enjoy creating these magical friends. Make the luck of the little people be with you! We added a cute little pocket to the front to shelter a treasure or sweet note. Learn how to make them with our free tutorial, below. Collect felt, stuffing, and needle & thread. 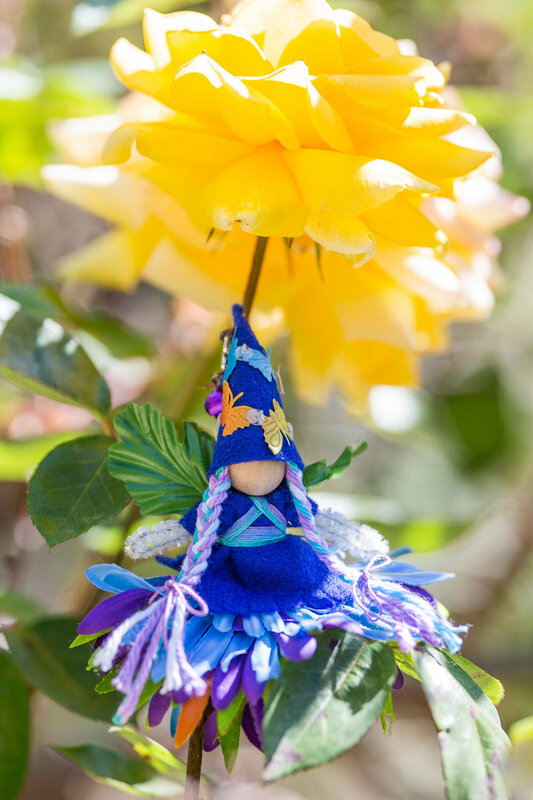 Choose decorations from smaller felt flowers and leaves to beads and sequins and/or a button. The only limit is your imagination (which is limitless). For a mini-pocket heart, cut two hearts the same size, and one smaller heart. Decorate the little heart. Double your thread and tie a knot. Bring your needle up from the back so the knot is hidden underneath. Thread your needle through leaves, flowers, and a button to hold them all down. Sew back down through the button and silk flowers and leaves. Add more if you like. When you are done, tie a knot on the bottom and clip the threads. Place your smaller heart on a bigger heart. You can hold it in place with a safety pin if you like. Tie a knot at the ends of the thread and start from underneath to hide the knot. Start by one curve of the heart. Sew up and down (the Dolphin Stitch) around the edge to hold the smaller heart on the bigger hear. Stop sewing when you like the size of your pocket. Take out the safety pin if you used one. Tie a knot and clip the threads. Now the little heart can hold a tiny treasure or written wishes and dreams. Place the two big hearts together. You can use a safety pin to hold them together if you want. Sew around the edges of the big hearts. We used a blanket (Rabbit) stitch. You can sew however you like. Take out the safety pin if you used one. When you get a few inches away from where you started, you get to stuff your heart. Add stuffing so your heart is nice and puffy and full of love. Sew the hole shut. Tie a knot and clip the threads. You can hide the threads by pushing the needle across the heart and pulling so the heart is kinda wrinkled. Clip the threads near the felt. Then, when you straighten the felt, the threads disappear inside. Fancy! Clip a thread that you sew once through the top of the heart. Slide the needle off of the thread. Tie the ends together to make a loop. Now your heart can hang in a window or a special place in your home. 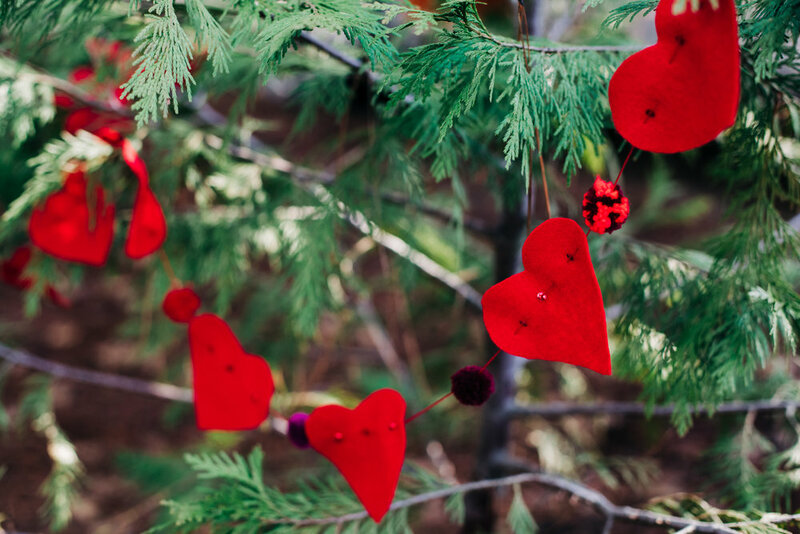 Decorating hearts has so many ways to be special. You can skip the pocket and decorate the front by itself to look wonderful too. Your heart reflects you. How do you want to make it lovely? PS: For the lace heart, we first sewed around the edges of the lace to hold it on the larger heart (you can see the light purple thread). Then we trimmed it to match the edges of the felt. Then we sewed just like the rest of the project. It's an extra step that may be fiddly for young crafters. However, the effect is gorgeous! We love discovering ideas from creatives. Each one is a new way to celebrate the friendship of Valentine's Day. Add to it that this time of year may be chilly outside, so it's a perfect time to sew (granted, I believe that every season is a wonderful season to sew). We collected a few of our favorite inspirations from around the web. Enjoy! How will we choose which project to make first? And of course a Love Fairy can join the festivities :). 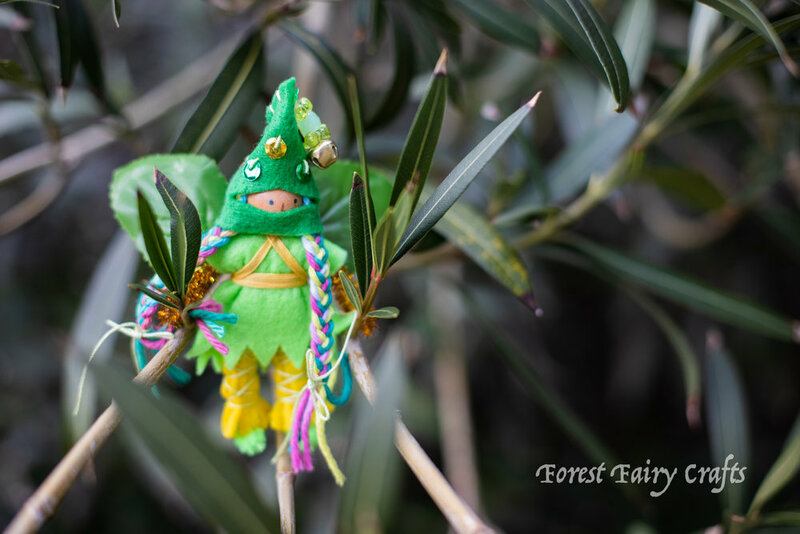 The Forest Fairy Crafts book has all the directions that you need to make her (a few more than will fit in a blog post. We're looking forward to sharing directions for the Sweetheart Fairy Babies in Magical Forest Fairy Crafts Through the Seasons releasing in late summer, 2018. Perhaps a quiet forest is not so quiet after all. Squirrels may be harvesting acorns, critters digging dens, birds building nests. This forest has been just like a real forest. While it has looked a little quiet around here, we've actually been frantically creative for you. We've thrown ourselves into the very best projects for a return to the forest. And we're so happy to share the news that more Fairy Crafts are coming your way in August of 2018. We embrace each season of the year with crafts. We find inspiration in colors and activities. We brought together our very favorites to write MAGICAL FOREST FAIRY CRAFTS THROUGH THE SEASONS. This book was so much work (so much!) and, yet, such a delight. We amuse each other by sending snapshots of the ideas. We hope that you smile as much as we did as you make these crafts. From seasonal families ready for play and decorating nature tables, to stuffed foxes and cats, to new treasure bags, this books has magical toys and decorations for children (or their favorite adults). We reunited with friends at Funstitch Studio for the return to the forest. Lots of people making these crafts look gorgeous while sharing all the directions. Did you know we made more than 250 little samples for the photographs? I should write a post about how we make each project come together. It's a big effort that is also rewarding when we see the book come together. Happy new year to you! This year will be filled with magic! The book will be available in August of 2018. 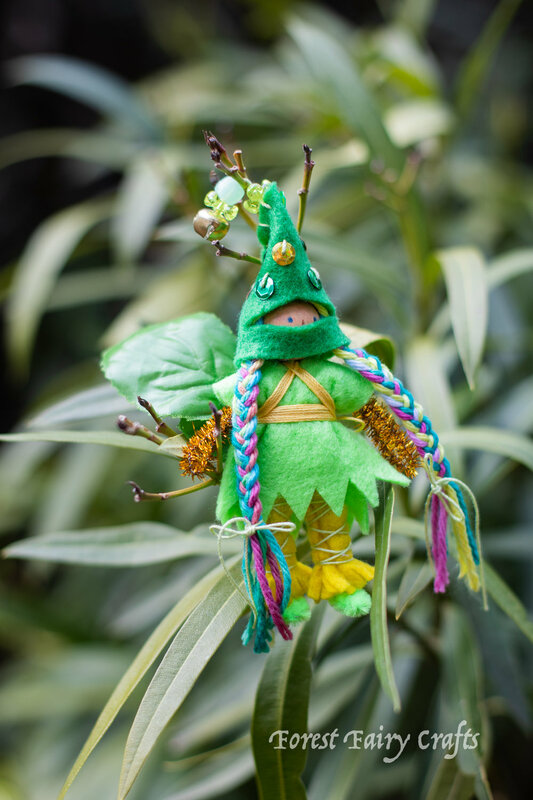 Until then, keep enjoying Forest Fairy Crafts with our first book! *affiliate link will give us a small portion of the amount while your price remains the same. Thank you!